NEW TALL TALE RADIO INTERVIEW! You can listen to the whole show right here or just search for “Tall Tale Radio” on iTunes! 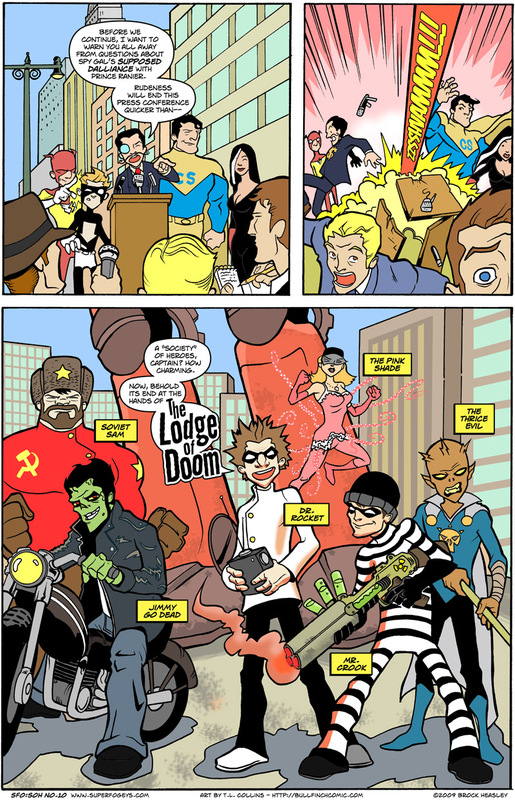 Today sees the debut of the Society of Heroes’ opposite–The Lodge of Doom. You’ve heard about its existence for a few months now, so I hope you enjoy them in full. Some of the characters, like Dr. Rocket, Mr. Crook (designed by Mike Hartigan), and the Thrice Evil you’ve already seen. The Pink Shade is a character that’s been mentioned a couple of times, but she, along with brand new characters Soviet Sam and Jimmy Go Dead had to designed from scratch by TL Collins. I think he did a fantastic job of making it look like all the characters came from the same brain, visually. The rest of this story is essentially The Society of Heroes vs. The Lodge of Doom, but there’s a big twist coming in page 13, so look out! See you on Thursday with SuperFogeys 205!